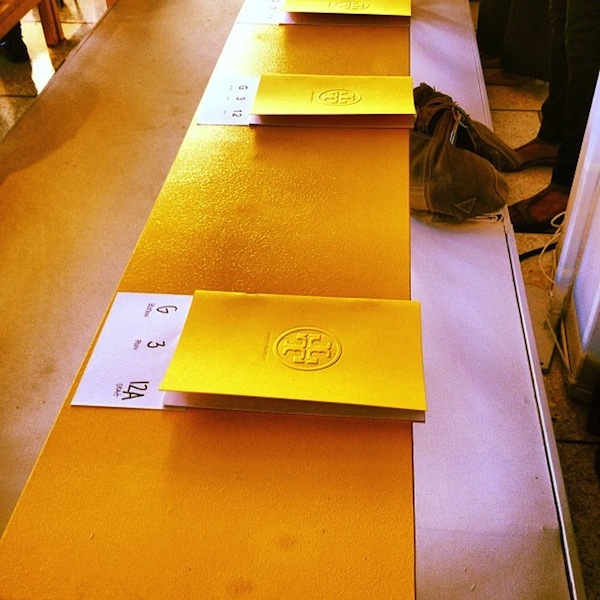 At Mercedes Benz Fashion Week, tt was a bright sunny day inside and out for the Tory Burch show at Avery Fisher hall. We all knew immediately what color was going to be the star of the show. After her fabulous fall show, channeling an interesting storyline for a sophisticated step up in her fashion profile, I wasn’t quite sure what direction she would take for spring. 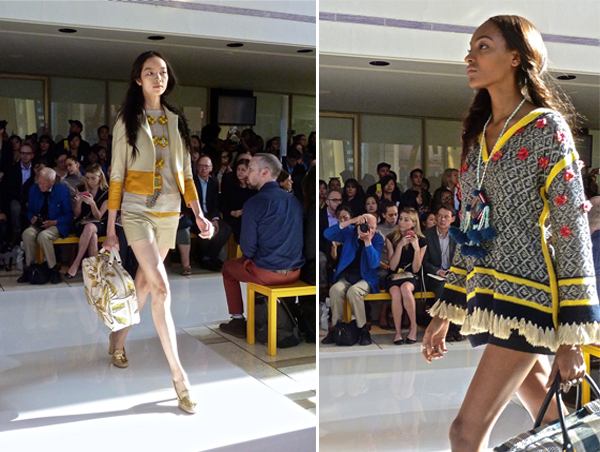 But it seems all is upbeat and relaxed in Toryland, as she presented a confident easy-going collection incorporating her interest in travel with her classic American sensibilities. The name of the game these days is globalization and Tory did a great job incorporating exotic themes in a very wearable way. 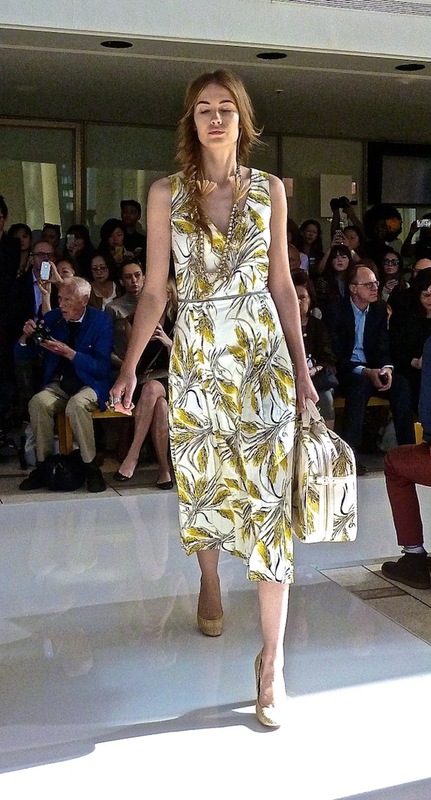 She opened with this breezy silk faille wheat print dress in a longer length that dominated the show. 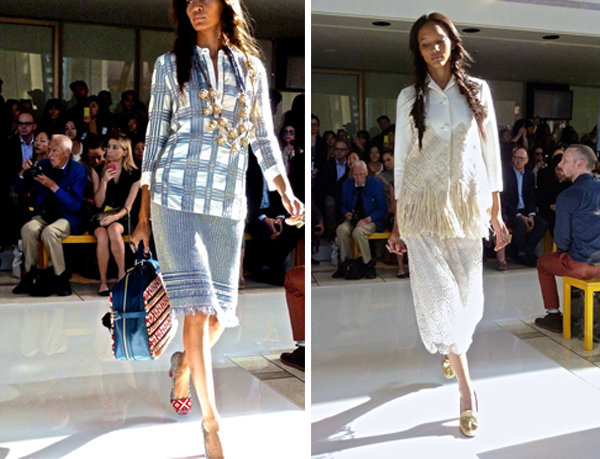 This theme was then interpreted into several different looks from sophisticated pattern mixing (below right) to textural embroidered and beaded combinations. to a fascination with fringe, all shown with a variety of large scale accessories and bags, telling a visual story of a “stylish magpie” who has assembled collections from exotic trips abroad. Burch also featured one-of-a-kind hand-dyed fabrics made exclusively for her by female artisans in Guinea, made possible by her foundation and There is No Limit Foundation’s Association of Women Tie-Dyers – she walks the walk. 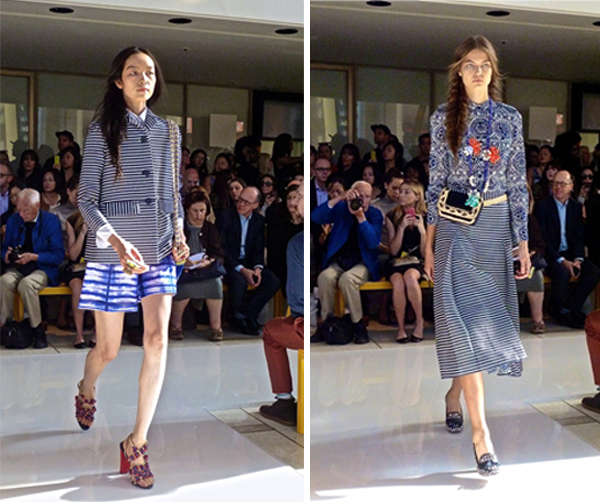 Many of these looks could be disassembled and rematched for those who are fans of Tory’s more traditional look. Stripes have been a theme this spring and both the raffia jacket and skirt below could look sharp all summer long with white tees or jeans and the chunky colorful jewelry. Navy is always classic for spring and the pretty every-so-versatile taffeta top, below right, features appliquéd tulle which is going to be big for the season. 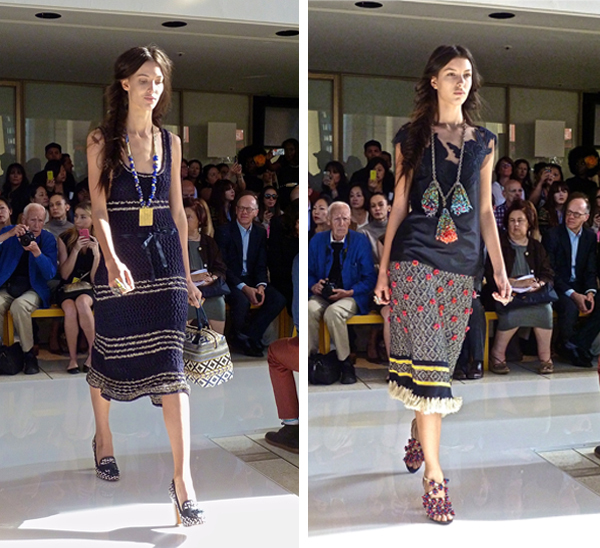 Some of my favorite pieces in the collection were the long dresses. 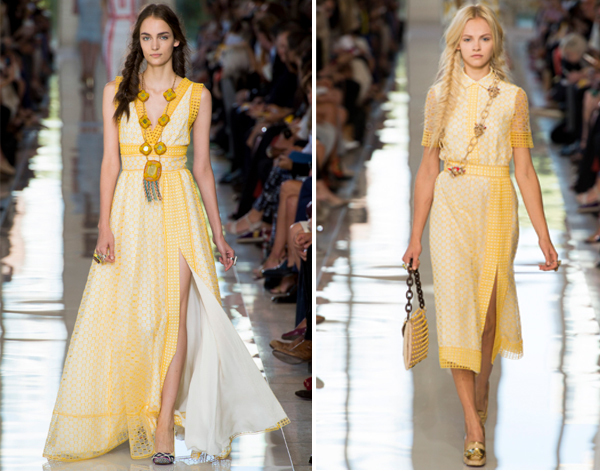 The signature yellow was lovely in this honeycomb-eyelet organza, shown in two varying lengths and styles. And I loved the final runway piece, this beaded silk crepe polo dress, perfectly expressing the “American prep remix” that Tory represents so well. Unless otherwise noted, all photos by Quintessence. This entry posted in fashion. 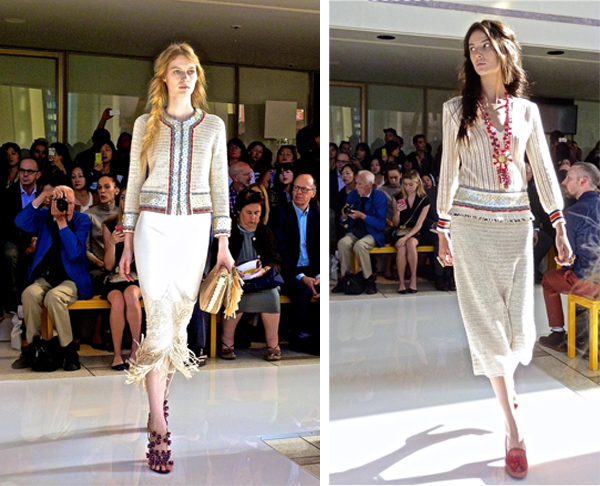 Entry Tags: fashion, Mercedes Benz Fashion Week, New York Fashion Week, Tory Burch, Tory Burch spring 2013 collection Bookmark the permalink. Fabulous coverage!! I love her spring looks! love that shot with Mr. Bill Cunningham. What a treat to see things at such a flattering length. Love all the pattern, color and prettiness. Oh! That last dress has me all choked up for some reason. It is just wonderful! New and fresh, but with that definite sense of nostalgia. I just love it and the collection as a whole as well! Thanks for sharing it. Wonderful. How fantastic to have been there. 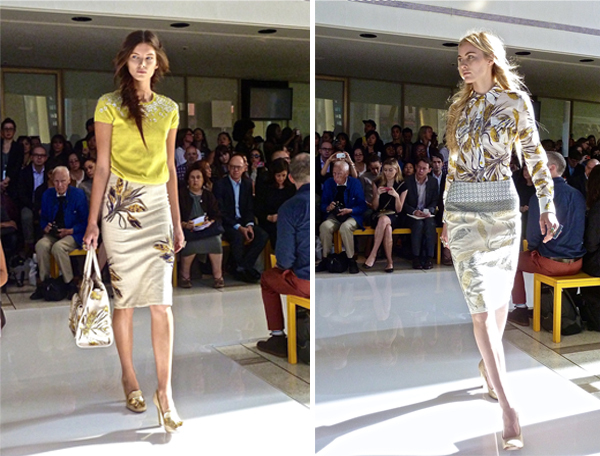 These looks are fabulous…and how nice to see the longer length! Beautiful mix and I see a lot of ethnic in there a direction my business seems to be going as well. What can I say… except…. just lovely! 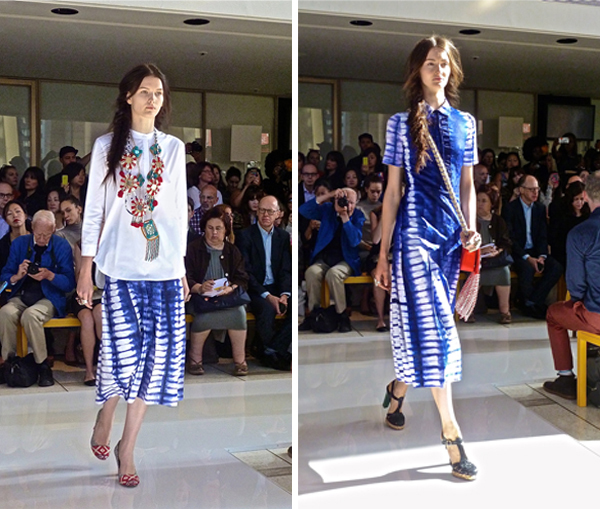 Loving the slightly ethnic and handmade feel of this collection and the mix of materials. Looks like you had a front row seat! Happy weekend, Q. Love the combination of blue, yellow, and red colors going on there. Spectacular Q.! Even though I missed it, you made me feel like I was there. 79 queries in 0.411 seconds.